I love my kids and love the way they love me. It is amazing how much love these tiny little beings exhibit. What is even more astonishing is their timing of showing such gentle love, it is like they can sense when I am in desperate need for a hug, a kiss, a gentle stroke on my face or just a loving look with a smile that just tells me it will all be alright. My daughter always knows how to get me to smile and forget all my worries, she is my sidekick who always comes to my rescue when I am feeling defeated. She doesn’t talk, all she does is come as close as she can get to me, gently grabs my face with both hands, looks in my eyes and then gently strokes my face, gives me a pat on the head and end it with a hug. How could I not melt and forget all that bothered me after such gentle act. True love is what I experience, one that is pure and comes from the heart. I love my kids and will forever be amazed at how such tiny bodies have such big hearts. Looking at them makes me wonder what happens to a person that leads them to hate. Hate is not natural for if it was, it would be there from day one. But it is not there because we are all born with nothing but love in our nature. I hope that I would be able to retain that love that I see in my children and that hate never finds its way into their hearts. It was the first day of Ramadan 2015, the decorations were up, The months goals and meal plans were set- everything was prepared to make this the best ever, Insha’Allah. “Nothing can come in my way,” I thought at suhoor. Alas,…I thought too soon! Waking up after suhoor, I knew what needed to be done: change the kid’s diapers and clothes, feed them, and clean and marinate the chicken for Iftar. In my mind, this was just going to take about 2-3 hours after which I would have the rest of the day to read Quran and do dhikr. Things were going well and getting done, but somehow I’d forgotten that with 3 kids under 3, there was no telling what could arise according to their or the world’s schedule. At 5 PM I was satisfied with what I had done so far, when I heard the thunder storm warning in our area. “It’s just going to be a little bit of thunder,” I thought to my self. “How bad can things get?” An hour later I heard the rumbles of an incoming storm and my lights flickered. More thunder followed and then there was a big BOOM! and the lights went out! The twins started crying and my toddler followed suit. So much for reading a Juz a day! I had to console them and quickly so not to wake up their dad who had just come home from work. I couldn’t see anything in the kitchen anymore. The fridge had to be opened sparingly because who knew how long this outage would last. The lightning continued to scare the kids but thankfully the eldest recovered. Soon she got the twins entertained by putting up her own light show with a torch. She also kept herself and me busy by blowing out the candles that I placed around the kitchen. The power outage lasted 3 hours. Alhamdulillah I have a gas stove, so I was able to prepare the food. 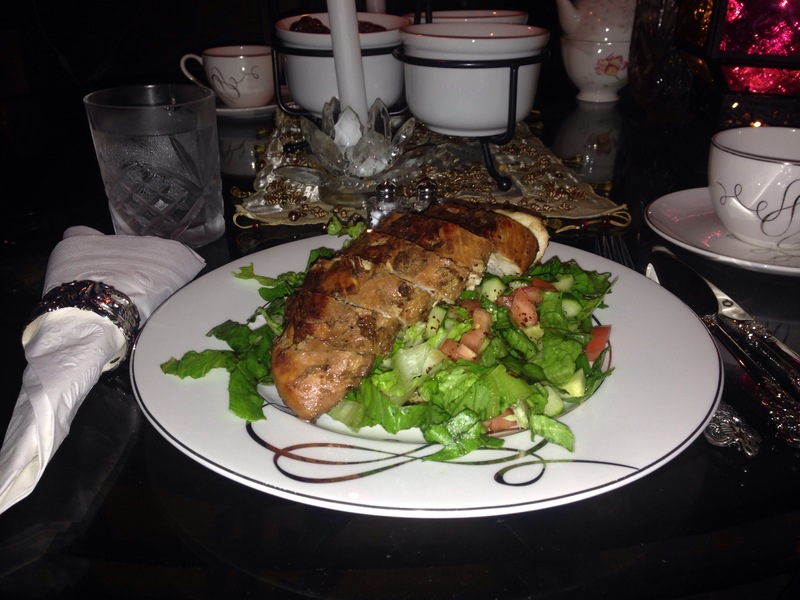 And since our Ramadan’s meal plans consist of light and simple recipes I was able to prepare grilled chicken and salad and had a wonderful candle-lit iftar. Alhamdulillah, despite all that happened, the day was successful :).